When I was child, my best friend Greg and I went through a stage of imaginative paper-based adventures — sure, we occasionally played “cowboys and indians” and whatnot, and we played with toys and action figures, instilling life into Star Wars figurines (I even vaguely recall a Star Wars lunch pail!) — but this was different. This was actually a very simplistic, childish sort of ‘game mastering‘. I can’t remember how it actually started, but this was what we did for fun: We each took turns designing mazes on paper, secretly, on our own time, and then we’d sit down and take turns pretending to be trapped in each others’ mazes, exploring and trying to escape by saying where we wanted to go or what we wanted to do. If I was the one exploring, I’d only see a portion of the map – whether it was obscured by a piece of paper with a hole cut in the middle that he’d move around to follow where “I” went, or whether he actually drew the maze as I moved around. But as I explored, as I turned each corner, opened a door or entered a new area, something new would happen – I might discover some treasure, a special item, some crazy mysterious object, or have to face an enemy and decide what to do. Whatever happened after I made my choice was decided by him. The levels we designed for each other would typically be very simple (we were kids after all), but we loved the fun of exploring, interacting with other, and making decisions on the fly knowing that the results really were made up as we went along – that’s what made it fun. The more we played, the more adventurous our games got, the more our levels ‘matured’ as we tried new things. The environments became labyrinths, forests, or space ships with intricate maps and structures. We’d start writing little introductory stories to lay out a mission or some task that had to be accomplished. I remember designing out levels of buildings, with secret rooms and interesting items to find, pick up and discover. We even built in ‘triggers’ where, for example, we’d note that somewhere on that map a door or hole in a wall might now be open if they picked up a particular item or flipped a switch somewhere else. As a child, this was our game-like way of storytelling, of having fun, and it was a unique sort of adventure for us. This type of gameplay was of course nothing new – it’s a basic form of what’s known as table-top role playing, where a game-master (GM) creates a world, and leads other people, friends or acquaintances, in a game of exploration with characters the players design and improve within the guidelines of the environment defined by the GM. Every action and decision is interactive between the player and the GM, and the story itself might unfold over the course of a day, weeks, months, or more. It’s also the basic structure of role playing games (RPGs) – where a player controls an avatar of sorts, and explores a storyworld, discovering its story and seeing their character grow and change dynamically with every decision they make and encounter they face. As I grew older and migrated to computers for gaming, that form of play translated to computer RPGs – text-based dungeon crawlers (like Zork), early internet Telnet environments (like the Muddy Waters MUD), and classic graphical RPGs (like the Bard’s Tale trilogy). One thing remained the same for me, however – it wasn’t the idea of role-playing that I loved as much as the act of discovery. Any game that had a complex story or an environment ripe for exploration, I set out to map. Whether it consisted of rooms I connected as nodes and lines on paper after exploring cardinal directions in text, or whether it was a map of walls and doors sketched on grid paper – I simply had to discover and explore, to visit every nook and cranny, find secrets, uncover the whole story. Today, when I look back at those games I first played as a child on a piece of paper, I realize that the passion I had for exploration and discovery has translated into what many today call alternate reality games (ARGs). While both ARGs and RPGs both generally consist of core narratives, ARGs do have a clear distinction from RPGs. In a role-playing game, the player enters the realm of the story in the form of a character or avatar; you play that role and explore the storyworld within its reality, revealing the narrative and building your character. In an alternate reality game, it’s the other way around – it’s as if the characters in the story are “playing the role” of real beings in our reality. Where in an RPG, the Game Master effectively throttles how we role-play a character in their world, in an ARG the Puppet Master (PM) defines how the characters play their roles in our world. And yet, the PM still has the final creative word on how the story plays out. They decide what narrative is uncovered, what characters exist and how they interact, what events will, can, or might happen, and to what degree the players influence the story. But, by its very nature of playing out in our reality rather than in a relative sandbox of a defined world environment, it means the results of every action and decision made by the player are essentially decided live by the PM. As a result of this interaction, the story that the player takes away from an ARG can potentially be far more personalized – not based on the decisions of the character they role-play, but based on their decisions in the real-world, on themselves, now an actual part of the story. For myself, I also find it interesting that my childlike love for exploration and discovery, for mapping out environments and worlds, has translated to the ARG genre. 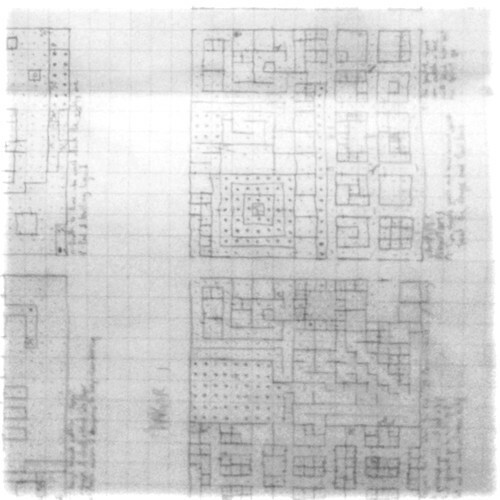 If the world of an RPG could be mapped out on grid paper, then the ARG equivalent could be described as the ‘trailhead’ — a timeline trail of interconnected events and assets laying out the route that the player, or players, have taken through the experience, through the open-ended exploration of… well, a real-world series of ‘nodes’, as the story is revealed. For me, that love for world-mapping has taken shape in the form of the wiki. That eventually led to the creation of Wikibruce.com – the resource I set up for ARG players, providing a platform to ‘map out the story-world’ as it were; to document discoveries and retrace stories as they’re uncovered – stories created by the puppet-master as their games progress. I was never really one for “role” playing, personally (heck, I can count the times I’ve dressed up in a costume with three fingers). And even in ARGs I’ve recently begun taking more of a back-seat when it comes to interaction and ‘play’ (mostly due to lack of spare time). But this, really, is one of my attractions to the ARG genre — I don’t have to play some version of me that isn’t me. I can just be myself (with a tiny bit of suspended disbelief, or rather performance of belief). If you think about it, it’s actually the PM that ends up playing more characters roles in an ARG than the players themselves. An ARG provides an experience for both the discovery and creation of a dynamic story, in real-world time, that interacts with and incorporates its audience and elements of their real life within its narrative – from its beginning through to its end. This is, to me, the most appropriate description of an alternate reality game or what I, here at 4DF, refer to when I say four-dimensional fiction. It’s my childhood pencil and paper games of discovery and adventure translated to 21st century real-life story-based entertainment — whether I am the one exploring the maze, or the one secretly drawing out the levels. Those maze-games are incredible… So fascinating. What an amazing solution to create that sense of exploration and interactive narrative.